SlotCarPortal.com, established in 1995, is one of the most recognised references for researching Scalextric products. This website is an image reference library best used in conjunction with the books ‘Scalextric – Past & Present’ and ‘Scalextric – The Ultimate Guide’ (Editions 1 to 8) published by Roger Gillham and Adrian Norman. 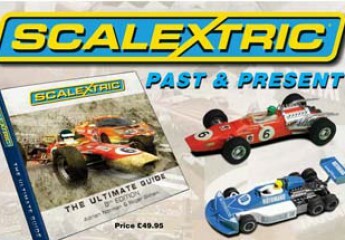 These pages serve as an online resource for Scalextric enthusiasts, fans, racers and collectors. The Brands: MiniModels, Scalex, Startex and Scalextric & Superslot. Products: Sets, Cars, Accessories and Track, Buildings, Motors and Guides. Production from UK, France, Spain, Australia, New Zealand, Japan, Mexico, USA, Canada, Argentina. Rare colours and liveries, exclusive products, Limited Editions and Special Editions. TV and Film related products: Batman, James Bond, etc. And of course, they contain listings of all cars, sets and accessories detailing all the variations to help you identify items in your collection or those that you seek, making these books the perfect guides to the history of SCALEXTRIC. This website, SlotCarPortal.com, supports the Scalextric books with more images and information and acts as an interim update between printed book publishing dates. This is a reply I entered at the ‘Leave a Reply’ box at the foot of the Home page.